Where to Buy Drexel Suffa, Drexel Suffa A Flowable 6 Pound Elemental Sulfur - 2.5 Gallon - $74.95 for Sale with Fast Free Shipping! 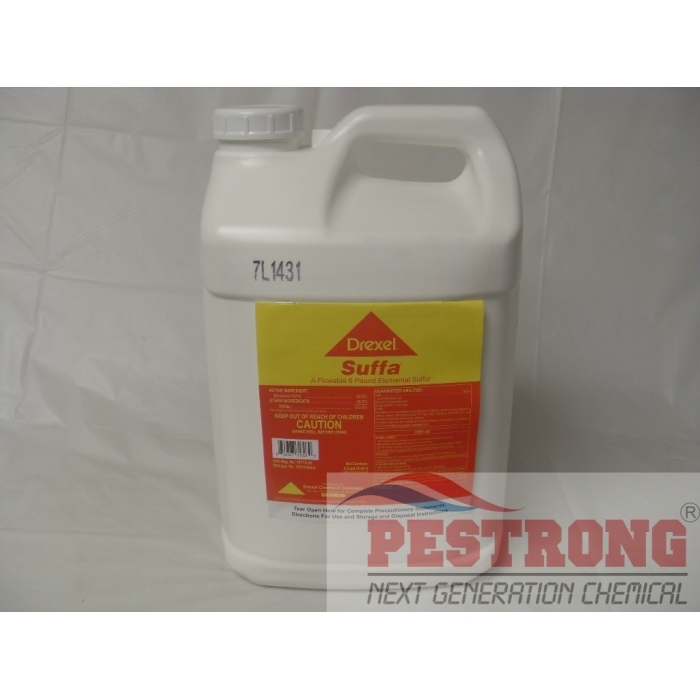 Drexel Suffa A Flowable 6 Pound Elemental Sulfur - 2.5 Gallon is a flowable fungicide for the control of a variety of diseases in Citrus, Field, Fruit, Nut, Ornamental, Turf and Vegetable applications. Drexel Suffa contains sulfur, which is essential for plant growth. Drexel Suffa can be used on all types and applications on Turf, including, but not limited to Golf putting/non-putting greens. Dogs and Domestic Livestock (Equine, Sheep, Cattle, Swine and Goats): To control Fleas and Ticks, apply 20 gallons per 20,000 sq. ft. as a spray (1 to 2 gallons per 100 gallons of water). Apply thoroughly to all interior surfaces of quarters. Force sprays into cracks and crevices. Repeat application as needed. POULTRY AND POULTRY HOUSES(Chickens, Turkeys, Ducks, Geese, Game birds and Pigeons): To control depluming Mites, apply 20 gallons per 20,000 sq. ft. as a spray (1 to 2 gallons per 100 gallons of water). Apply thoroughly to all interior surfaces of quarters. Force spray into cracks and crevices. Repeat application as needed. How soon after applying Suffa can an oil application be made? Do not use Suffa with oil or within 4 weeks of an oil application, unless noted otherwise on the label under specific crop directions. Will Suffa cause burn on my crop? During periods of high temperatures Suffa may burn foliage and fruit. Consult with your local extension service for recommendations. We will ship any brand of Liquid Sulfur -- 52.0% depends on current stock & availibility. Great sulfur product. Easy to apply. Very good to use.